Alaska is almost completely surrounded by water on three sides. To the north lies the Arctic Ocean, the Beaufort Sea and the Chukchi Sea. To the south is the Gulf of Alaska and Pacific Ocean. To the west is the Bering Sea. In addition, Alaska boasts over 3 million lakes greater than 20 acres in size. The Yukon River is the longest river in the state at 1,875 miles. About 91,300 square miles (almost 14%) of Alaska are covered by water and its shoreline is 33,904 miles long. What is Alaska's maritime history? Alaska's cold waters are prime habitat for whales and sea mammals, which the Aleuts and Eskimos have been hunting for over 2,500 years. Whaling, fishing, and shipping have been major industries in the state especially since Russian days after the St. Paul, a Russian Navy vessel, first made landfall in Alaska on July 15, 1741. Soon after, the Russian-American Company began hunting otters and colonizing parts of coastal Alaska, but high shipping costs prevented the colony from becoming profitable. American whalers frequented Alaskan waters from the mid-1800s to the 1930s, when it became commercially unprofitable and international agreements to protect whales were signed. Off Kodiak Island lie the remains of the Russian-American Company ship Kad'yak, which sank in 1860. The oldest shipwreck discovered in the state, the Kad'yak holds a special place in native lore about Father Herman, a Russian-Orthodox missionary, who established an orphanage and chapel on Spruce Island. After his death in 1836, the church canonized this beloved priest. In 1860, the Kad'yak's captain promised to pay homage to St. Herman at the Spruce Island chapel before setting sail for San Francisco, California, with a cargo of 350 tons of ice. He failed to keep that promise. Shortly after sailing off, the ship struck a rock, briefly drifted, and sank before St. Herman's shore-side chapel. When the ship sank, the mast and yard arm remained above the water, forming a cross that the native people believed to be a sign of divine retribution. The Kad'yak is only one of many thousands of wrecks in Alaskan waters. The volume of whaling, fishing, and shipping traffic coupled with the treacherous waters surrounding the state, resulted in many shipwrecks lying in the depths of Alaska's cold waters. 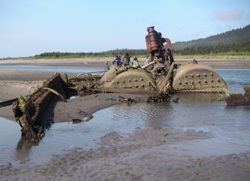 Some wrecks in southeastern Alaska include Princess Kathleen, Princess Sophia, Clara Nevada, and Islander. A number of American and Japanese warships also were sunk or lost off the coast of Alaska between 1942 and 1945.
Who takes care of Alaska's underwater archeological sites? The state owns all archeological resources situated on state land, including tideland and submerged land. The state also has the exclusive right of field archeology on state-owned or controlled land, which means a permit is required to study shipwrecks. 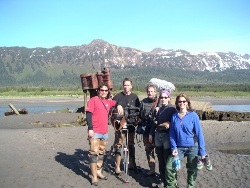 Alaska's Office of History & Archaeology and the State Archaeologist are responsible for the submerged archeological sites. These offices often collaborate with other government agencies and universities to collect information about the state's historic shipwrecks. Universities, accredited museums, and individuals with a degree in history or anthropology, a minimum of six months field experience, and expertise in marine archeology may apply for a permit to study shipwrecks in Alaskan waters. All data and resources obtained under a permit must be made available to the general public. Permit applications are made to the State Archaeologist. Recreational diving on shipwrecks does not require a permit but disturbance or collection is not allowed unless done under a state permit. 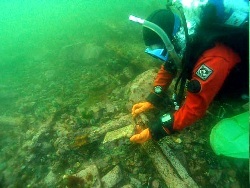 What laws concern underwater archeology in Alaska? 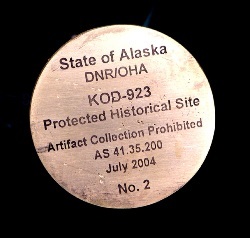 The Alaska Historic Preservation Act is codified at Alaska Statutes �� 41.35.010, et seq. Related regulations can be found at Alaska Administrative Code Title 11, �� 16.010, et seq. These laws and regulations declare that the state preserves and protects its historic, prehistoric, and archeological resources from loss, desecration, and destruction so the scientific, historic, and cultural heritage is undiminished when it passes to future generations.